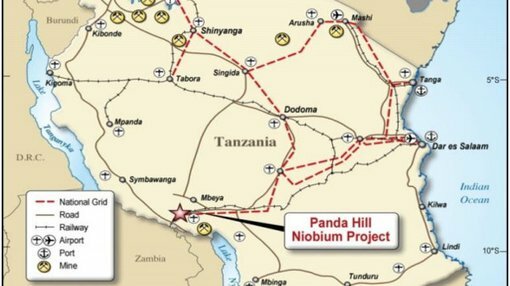 Cradle Resources Ltd (ASX: CXX) has begun a new drilling programme at its Panda Hill Niobium project in Tanzania to further define its inferred 82Mt resource. The 78 hole drilling programme comes as CXX accelerates a Pre-Feasibility Study (PFS) at Panda Hill to support the development of a 2Mtpa mine. All of this activity comes after CXX secured up to US$20M in funding for Panda Hill from an Africa-focused investment platform also taking a 50% in-terest in the project. Tremont Investments Limited (Tremont) will pay CXX up to US$20M as the sole funder of the Defini-tive Feasibility Study (DFS) phase of the mine’s development process and more funding is expected beyond this stage as CXX moves toward a Decision To Mine. The PFS is expected to be completed by the first quarter of 2015, when the DFS is scheduled to begin. Niobium (Nb) is a key ingredient in High Strength Low Alloy (HSLA) ‘super steel’ increasingly being used to build bridges, buildings and high end automobiles. Nb sells for around $40,000 a tonne and no new source of the material has come on stream since 1976. CXX’s acquired a 50% stake in Panda Hill Pty Ltd in 2013 and retains an exclusive option to secure the balance of ownership by 2017. If CXX can bring Panda Hill into production its resources could deliver 3.3% of the world’s supply of Nb. The first phase of the drilling program will see 78 diamond drill and reverse circulation (RC) holes drilled for a total of 8,100m. This work is expected to be completed by the end of September with assay results expected between mid-August and early November. The overall goal is to upgrade the resource at Panda Hill from inferred to measured and indicated status. A 13 hole diamond drilling programme completed in 2013 estimated an inferred resource of 81.8Mt at 52% Nb. This resource was identified in the area of the Panda Hill prospect that will now be targeted by this new round of drilling. CXX says the exploration programme is designed to improve the company’s understanding of the de-lineation of the different ore types within the resource and increase its confidence in the current re-source model. The drilling will also be collecting samples of ore for a further round of metallurgical test work. CXX released results from an initial round of mineralogy test work in January that was carried out on samples of Nb from Panda Hill by a Canadian laboratory. The samples were taken from area known as the weathered cap and show Nb can recovered at a comparable rate to the three existing global produc-ers. The tests showed the maximum potential Nb recovery at 55% Nb205 grade is between 75% and 82% – compared to the fresh ore average of 88%. This means CXX can compete with the rest of the industry which averages a recovery rate of between 50% and 60%. CXX says the first batch of samples from the new round of drilling will be sent for assay to the SGS laboratory in Mwanza, Tanzania where the samples will be prepared prior to final analysis at the SGS laboratory in Johannesburg, South Africa. First assay results are expected in mid-August. The drilling activity represents the beginning of the technical aspects of a Pre-Feasibility Study to de-velop initial plans for a 2Mtpa Nb mine at Panda Hill. The drilling and metallurgical test work will be conducted on a timetable for the remainder of 2014 that also covers a Mineral Resource Estimate, an Options Study, Preliminary Mining and Engineering Stud-ies as well as an Environmental and Social Impact Study. CXX has appointed a number of companies to undertake this work after a tendering process was carried out earlier this year. The PFS will build on the results of a Scoping Study that was completed in January 2014. It showed that CXX can build a 2Mtpa Nb mine for $185M, 19% lower than initially thought. The study’s base case puts the average cash cost of producing 1kg of Nb at $16.67, gives a mine life of 28 years and says the capital costs can be paid back within three years of operation. The niobium resource at Panda Hill is close to the surface and has a strip ratio of 1:1 meaning an open cut mine is possible which should reduce operational costs. CXX’s Managing Director, Grant Davey, says the PFS is a crucial step for Panda Hill’s development. Prior to beginning the new round of drilling, CXX secured a project partner to help bring Panda Hill through the development phase and take it into production. Tremont Capital Investments is an Africa focused mining platform that raised $200M from the global private equity firm Denham Capital to target resource opportunities in Africa. Denham has over US$7.9BN of capital in the metals and mining, oil and gas, and power sectors. Tremont will acquire a 50% interest in the Project by making four payments of $5M with the DFS ex-pected to be completed upon payment of $15M. The balance of the money will go toward further de-velopment work at Panda Hill. The first payment has already been received by CXX and each tranche will earn Tremont a 12.5% share of the project for a total of 50%. The deal cuts CXX capex for a base case $185M 2Mtpa mine to $62.5M and also gives the company access to a broad range of African mining development experience contained within Tremont’s leader-ship group, along with potential access to Denham capital’s financial support. CXX’s Managing Director Grant Davey says Tremont spent four months on due diligence before sign-ing the deal and its support is a positive reinforcement of the Panda Hill project’s quality. “Cradle is now in the enviable position of having an experienced partner with the financial, commercial and tech-nical strength to help drive the Panda Hill project into production,” he says. In addition to a new project partner, CXX has also raised A$3.6M in a placement from institutional and sophisticated investors in the UK. Investors were issued shares at $0.20 AUD per share for a total of 18M issued in total. CXX says the money will be used to pay out its existing creditors and provide working capital for Panda Hill. The broking firm Mirabaud Securities, headquartered in London, has initiated coverage of CXX giving it a A$0.50/share valuation. Mirabaud notes that Panda Hill is one of the world’s few undeveloped niobium resources and has a grade and metallurgical simplicity that can compete with the current supply base controlled by three primary producers. It says if CXX can develop the mine fully it would provide “some welcome geographic diversity to this supply base, which is currently dominated by Brazil”. Mirabaud also says CXX benefits from its location in “mining-friendly Tanzania” and has an array of existing infrastructure close by including roads, rail, power lines and the regional commercial hub of Mbeya which hosts an international airport. It says CXX enjoys “luxuries most mining project devel-opers in Africa can only dream of”. However, Mirabaud also warns that the niobium market is relatively small and predicting future prices for the resource CXX will be so reliant on is very subjective. The Australian stockbroking firm Patersons has also released a new note on CXX with analyst Simon Tonkin calling the decision to bring in Tremont as a 50% partner an “attractive deal” for the company’s investors. He sets a target price of between A$0.39-0.61 a share, building on a previous Patersons note that set a target price of A$0.42. Tonkin does list a number of risks that CXX may be exposed to. He says CXX may sometimes need to access the equity and debt markets to finance its exploration programme which could bring future dilu-tion to existing shareholders. He also states that the risk presented by any fall in steel production could adversely impact Niobium demand and impact on Panda Hill’s economics. However, Tonkin also reiterates that the deal with Tremont has cut CXX’s capital expenditure re-quirements in half. He says the Tremont deal allows the Panda Hill Nb project to be steadily de-risked, provides sufficient funding to reach a decision to mine, and brings in “a highly successful African min-ing partner to assist in the project’s development”.